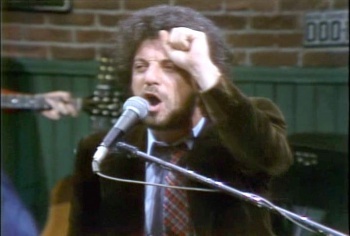 Billy Joel on SNL in 1978. The "Piano Man" himself, Billy Joel, asked for his songs to be included in Rock Band 3 because of a critic's snide remark. I'm a huge fan of piano rock in general and Billy Joel specifically and I've always been bummed that his songs had never made it into any of the music games like Rock Band or Guitar Hero. Even when the keytar controller was announced for Rock Band 3, I was sure that I would finally get my wish but the track list didn't even have any Elton John, let alone Joel classics like "Captain Jack" or "Miami 2017" (Seriously, that's one of my favorite post-apocalyptic rock songs ever. Check out his live version of it after 9/11.) Well, thanks to a snide remark by a fellow internet journalist, 12 of Billy Joel's songs will be available via download for Rock Band 3 but there is no word on which tracks or exactly when they will drop. Apparently, Harmonix had asked him to include his songs before, but Joel had always refused to have his music be in a videogame. "I've never allowed my music to be used in a game before," Joel told USAToday. But that was before he read a review of an episode of NBC's The Office on Entertainment Weekly's website. The episode from this May mentioned a then fictional game of Rock Band: Billy Joel and the author of the recap scoffed. "The critic wrote something like, 'God forbid that ever should happen,'" Joel said. "So I called my people and said, 'Get me on that Rock Band game.' Then I wrote the critic, saying that every time I get a check, I'll give him a little nod." The critic in question, Darren Franich, points out the absurdity of the fact that Billy Joel is reading his Office recaps but he denies that Joel ever contacted him. There is a commenter, however, on the the original Office recap from someone named Billy Joel that reads, "Sorry I took so long to write, Darren. I've been busy. ROLLING AROUND IN A POOL OF ROYALTY CHECKS!!!" If that is you Mr. Joel, that is just funny stuff. And I'm glad that I'll be able to rock out to your songs on my keytar as I have with my "Air Piano" for the last 25 years. Rock on, sir. Rock on.